Please view more information about our upcoming Mustagh Ata expeditions . We are now accepting applications for the summer, so please come on out again. 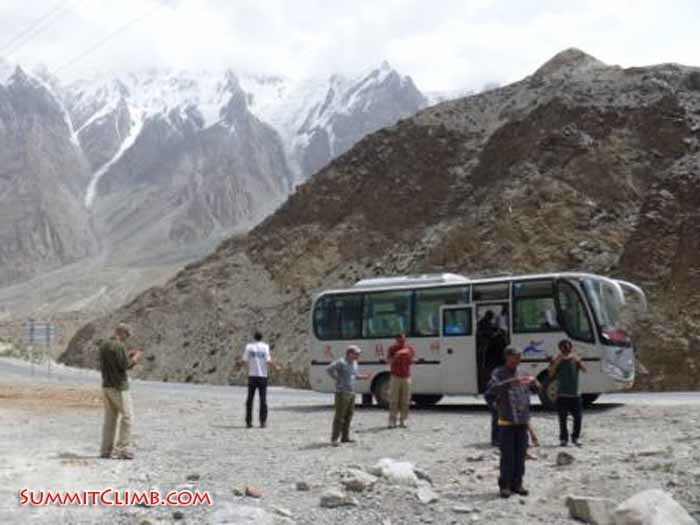 Trip Summary: www.MustagataClimb.com is an exciting chance to explore the towering mountains and high deserts of exotic central Asia, and you can even ski, snowboard, snow raquette, or snowshoe. Mustagata is known as the "world's easiest" 7500 metre / 24,500 foot high mountain that could be skied, snowboarded, snow raquetted or snowshoed. 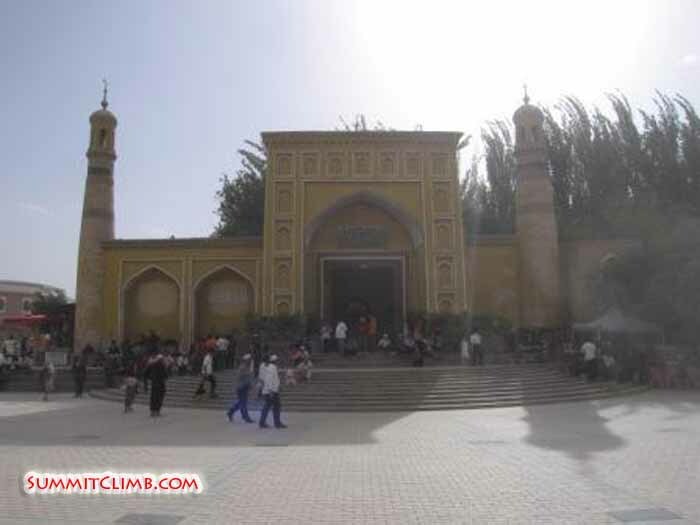 Our trip begins in the unusual city of Kashgar which is the ancient capital city of the old kingdom of East Turkestan. We can enjoy the amazing Sunday Markey with 1000's of horses, camels and other livestock being test-ridden and traded. After a few nights of exploring Kashgar and its environs while overnighting in our comfortable hotel we are ready to carry on up the "Gez Defile" which winds through the mighty Chinese Pamir mountain range to the sparkling blue Karakuli Lake. After a few more kilometers and hill crossings, we reach the old Tadzhik fortress and town of Tashkergan, where stay in a comfortable inn. The following day, we can walk around and exlpore the town, fortress and surrounding hills. After our rest day we are ready to drive to the "trailhead" where we are met by camels and their drivers, for the 3 hour approach walk to basecamp. We have been using the "first ascent route" on Mustagata, so we never see another climbing team on "our" route, as everyone seems to cluster over at the "new route" which is not as nice. 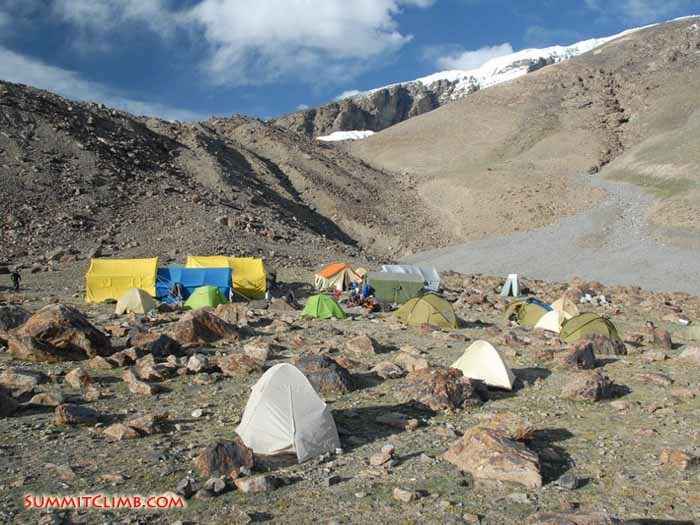 We rest in basecamp and then climb up and down the mountain several times, to successively higher camps. The good skiing, snowboarding, snow raquetting, and snowshoeing begins at around 5200 metres / 17,000 feet and goes up from there. The terrain on Mustagata is not steep, with an average slope angle of 18 degrees, and could be described as "intermediate". 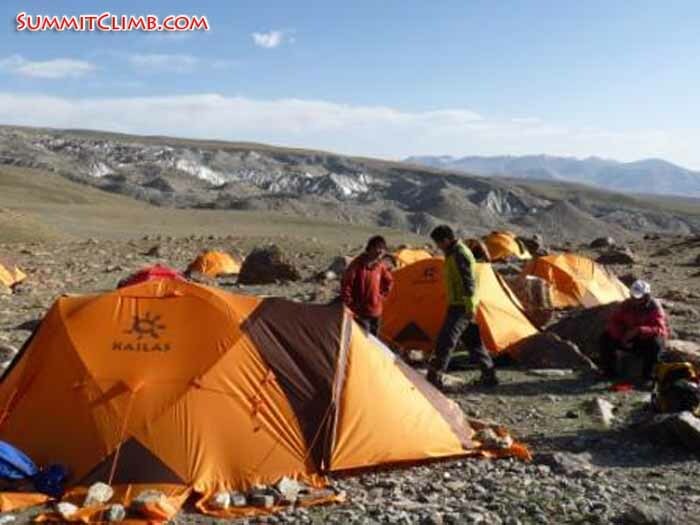 There are three camps, and this is a very high mountain, so good acclimatization is rather important, with several trips down to basecamp to rest and eat delicious food prepared by our skillful basecamp staff. 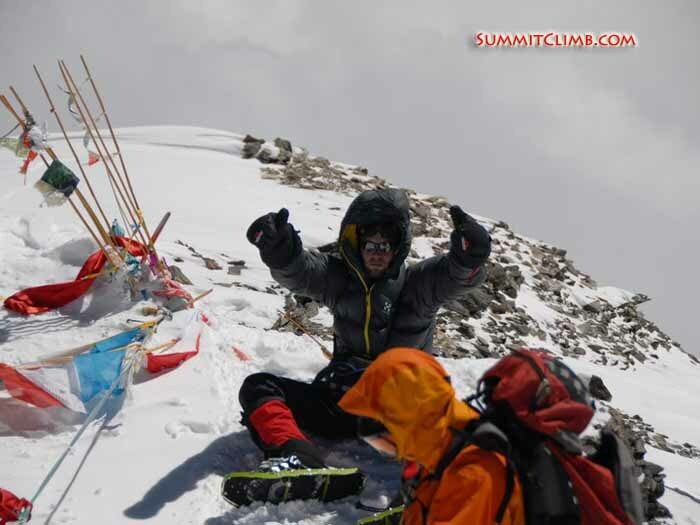 Finally, after reaching camp 3, we try for the summit. 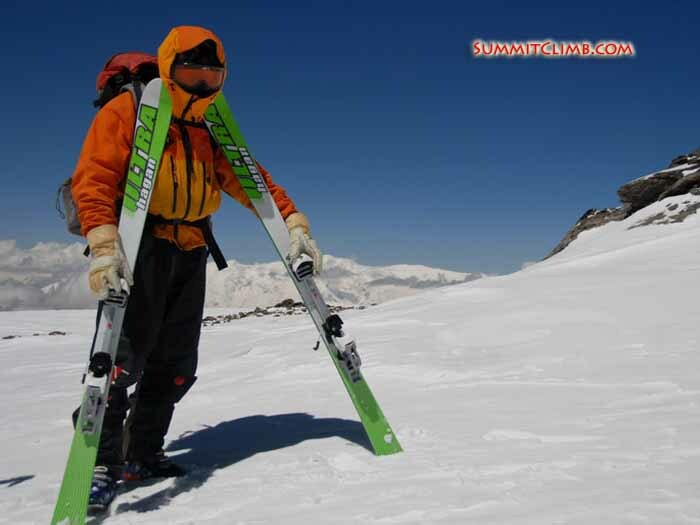 Summit day is a high altitude experience, walking on gradual snow slopes with incredible views abounding, we can see Mount Kungur, the highest mountain in the area, and also are treated to views into distant Afghanistan. Thanks for joining our team! Everybody was back in Base Camp this morning. John even stumbled in at 3am! For most off us it was a challenging descent, but everybody is happy to be here. So in the end we had 5 summits; Asu, John, Eric, Andrea and Christian. James decided to turn around at 7300m, but he made his personal altitude record. Congratulations to everyone! Right now we are packing up Base Camp. 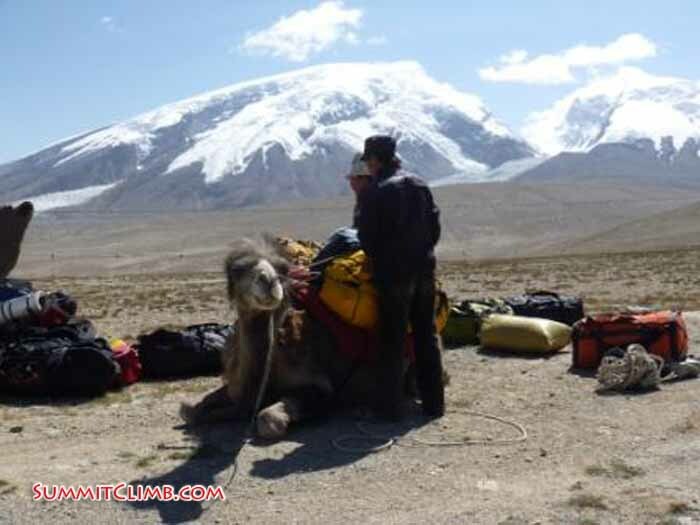 Tomorrow the camels will arrive early morning to bring all our gear to the road end. 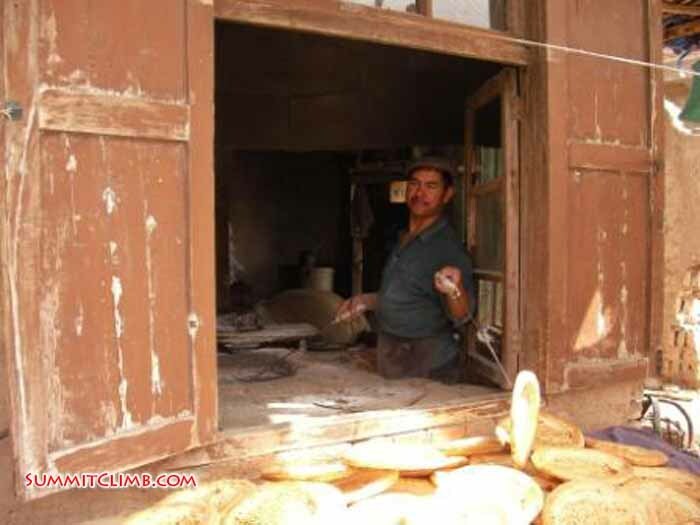 We will arrive in Kashgar tomorrow afternoon; to a good shower, cold beer and excellent local food awaiting us! Returning from the summit, SUCCESS! On the summit (Photos by Jon Otto). Today was a cold and windy day. 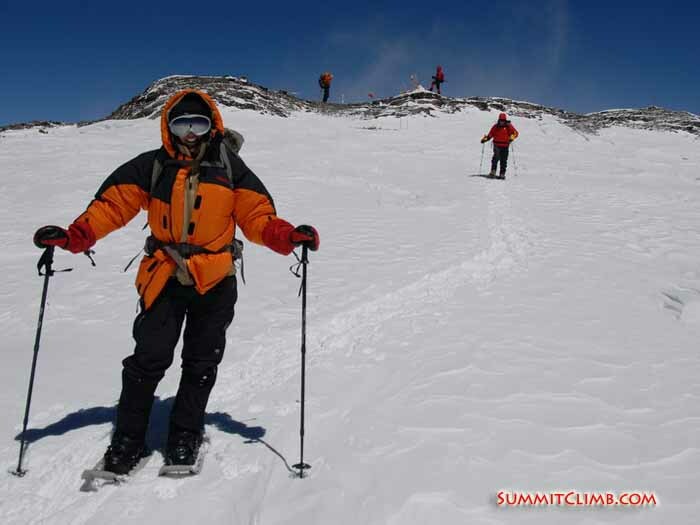 When we set off for our summit push it was about minus 20 C with a 30 km/h wind! We all pushed on for the summit, including three of our skiers Eric, John and Asu. 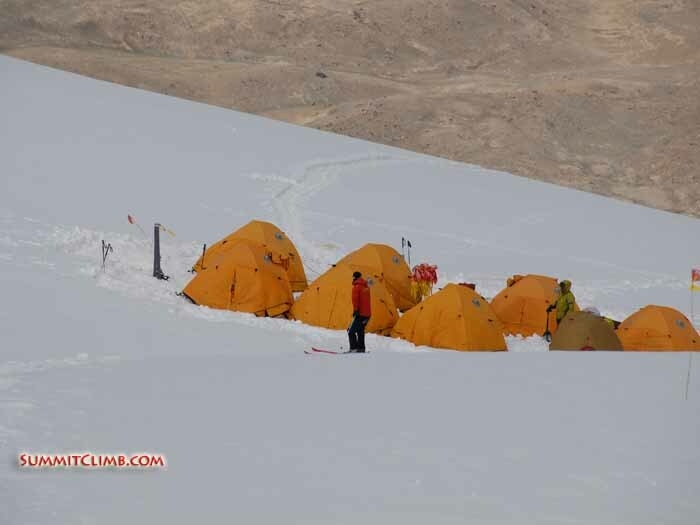 Tomorrow I will give an update who exactly summited, but all members are sound and safe in Camp 2 together with our excellent staff and will be down at Base Camp tomorrow. Martha, Tim, Brian and I are already enjoying the comforts of Base Camp. Hello SummitClimb News. This is Arnold again calling from Camp 2 at 6200m and today is the 19th July. We left Camp 1 this morning to move on to camp 2. Today was a kind of hard day as expected. We had a lot of snow, white ice conditions and it was quite a windy day but everybody did well and was strong and made it in good time up to Camp 2. It looks like the weather is changing to our benefit. It’s cleared up a little bit, the wind’s died down and tomorrow should be a better day although tomorrow is not going to be the best day yet. Tomorrow we’ll probably go on to Camp 3 at 6800m. We still have cloudy conditions with a little bit of wind and we’re hoping that the weather will break on Thursday so that we can have a very nice summit day. 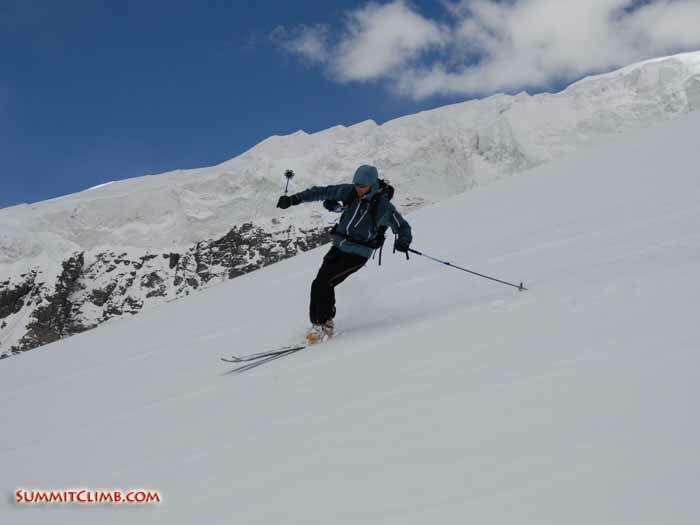 Skiing down from camp 2 (Photos by Jon Otto). At midday today we left for our final summit push of Mustagata, but before we go for the summit first we have to stay at Camp 3. Right now everybody’s in camp 1 all healthy and strong. The weather is not too good, not too bad. It’s been snowing a little and we’re expecting a bit more tomorrow which is actually good because we need some. If we’re lucky and the weather forecast is correct, then on Wednesday we should have some very nice weather and nothing can stop us anymore. Until Wednesday we’ll just have to climb higher, reach Camp 2 and spend the night there and the following day we’ll go to Camp 3. If everything comes together we’ll be summiting on Thursday the 21st. Greetings from base camp Mustagata, this is John Quillen with today's dispatch. We had a great rotation up the mountain all the way to camp two. On schedule the storm arrived. All of the team were safely ensconced in their tents. When the storm was over, we had a blanket of five to six new inches of powder. Yesterday morning some of the team ascended towards camp three. I decided to descend to catch the fresh tracks after all that new snow. Skiing at 20,000 feet/6000 metres is different, especially with a backpack, but fifteen minutes skiing and we were back at camp one. 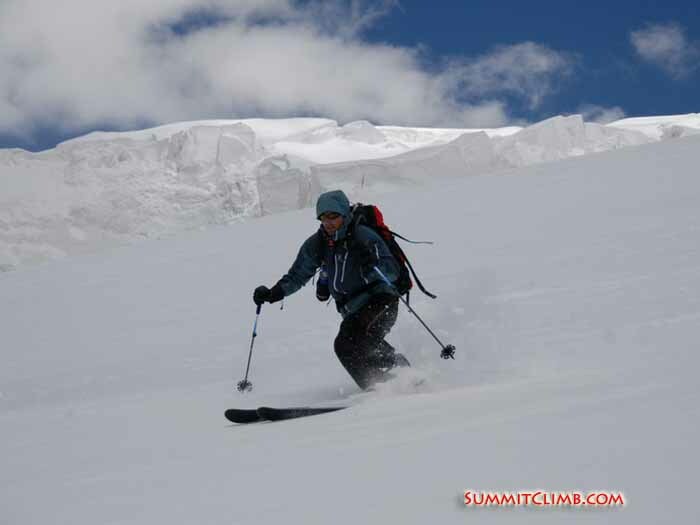 Skiing from camp 2. Basecamp during sunset (Photos by Jon Otto). Hello SummitClimb News, this is Arnold again. This time I’m calling from camp 2 at about 6200m and today is Thursday 14th July. Today we had a good hike up from camp 1 to camp 2. We expected a very sunny day, but fortunately later in the day it was overcast so it wasn’t too hot. Everybody made it in good health and good time and our staff did a great job pitching all of the tents so we only had to cook in the tent when we arrived here. Two of our members; Francois and Romain arrived in Camp 3 today and they’re going to try and push for the summit tonight so we wish them the best of luck. They’re very strong Swiss climbers and I know that they’re going to make it. I’ll give you more news about that tomorrow. The main group will probably go up a little bit more tomorrow morning and then we’ll ski down – all the way down to camp 1 and enjoy Samdien’s good food again in basecamp for dinner. Hello SummitClimb News. This is Arnold again calling from camp 1 on Wednesday 13th July. This is our third trip up to camp 1 for most of us and the second time we’re going to sleep here. It’s getting a lot easier now. Our bodies are getting adjusted to the altitude and our plan is to go to our last acclimatisation climb on the mountain before we go for the summit push. Tomorrow we’re going to climb to Camp 2 at 6200m and sleep there it will be our highest peak so far and then the next morning we’re going to climb to Camp 3 at 6800m this will finalize our acclimatization plan. After all that when we go back down to basecamp again we will be pretty much used to the altitude on Mustagata. The weather looks pretty good for the next couple of days. It’s been very hot the last two days and tomorrow and the day after will be hot too. On the snow there’s going to be a lot of reflection which is probably going to slow us down a bit. In two days time they’ve predicted a little bit of snow and I think that’s going to help us a lot because conditions have changed a little bit. Two days ago we came down with fresh snow but now it’s gone and it's kind of slushy and icy. I hope after our acclimatisation walk we’ll get some new snow again so that the way down will be much better. Asu on the summit getting ready to ski down. Asu skiing down from the summit (Photos by Jon Otto). Last night was our first night in Camp 1 on the mountain at about 5320m. The weather was nice and quite warm for this altitude. Everybody enjoyed cooking their own dinner and were excited to go higher up the mountain. We all skinned or snowshoed until about 6000m today. Conditions were perfect, about 25cm of fresh powder snow! The skiers especially enjoyed it a lot. It took about 3 hrs to skin up, but only 15 min to go back down to camp 1. 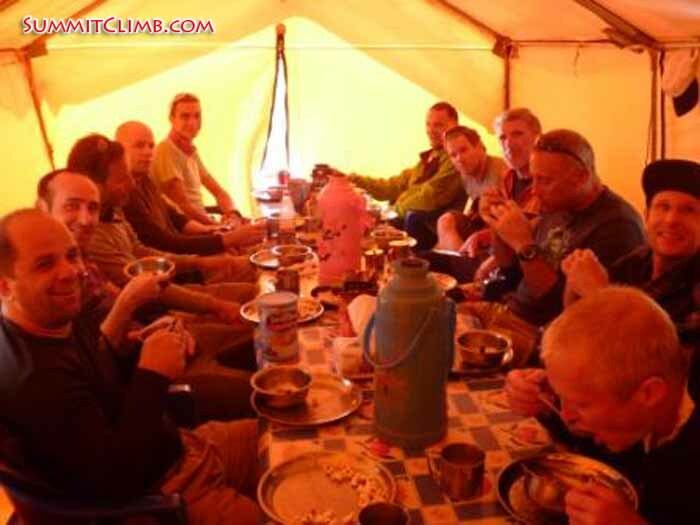 After a short rest in camp 1 we all went down to Base camp. Tomorrow will be a rest day, so there is time to shower, shave and wash clothes. Camp 1 at 5320 metres. 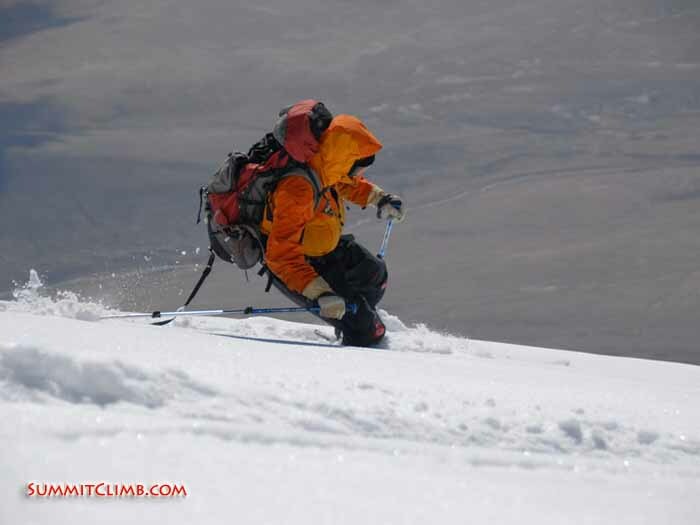 Skiing down from camp 2 to camp 1 (Arnold Coster). Hello SummitClimb News. This is Arnold Coster the leader of the Mustagata expedition calling from Camp 1 at about 5320 metres. Today is Sunday the 10th of July. This is going to be our first night on the mountain above basecamp. All members made it here in good time. Everybody is doing well. The weather has been changing a bit with sun mixed with snow. When we go further up tomorrow we should have some fresh snow. The conditions have been a bit icy so far, so a little bit of fresh snow isn’t going to hurt us. After tonight everybody will wake up and we’ll head up to camp 2 at 6200 metres. After a while we’ll descend back to camp 1 and by the end of the day we’ll probably reach basecamp to rest and recoup. This is the start of our acclimatization on the mountain. We need to go to camp 1 and camp 2 before we can make our summit attempt. This is called acclimatization and we need this time so our bodies can adjust to the altitude. We all reached camp 1 for acclimatization and are ready to sleep there tomorrow. Everybody made the hike in good time, even though the weather changed for the worse in the afternoon. On the way down we had to deal with white out conditions, but everybody coped with this easily. 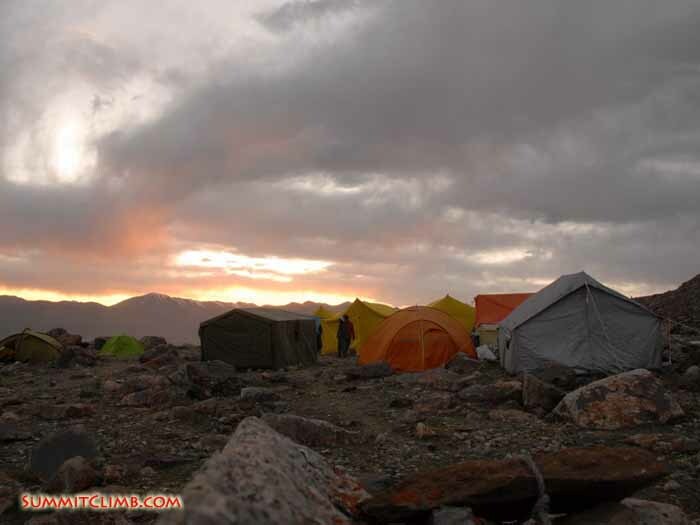 Tomorrow we will go up again and spent our first night in one of the high camps at around 5350m. The next day we will try to reach Camp 2 at around 6200m, before we go all the way down to Base Camp again. Our comfortable camp 1 just above the snowline (Jon Otto). Today we took it easy, everybody prepared their bags for the climb up to C1 tomorrow. Local porters will help us carry our gear up to C1, so we can have an easy start. Our staff already went up to C1 to carry the first group equipment and explore the route. This year conditions look a bit icy, but this shouldn't be a big problem. Some off us went for a short hike to the other base camp at the other side of the glacier. It's a completely different story there, more than 300 people! We are so happy we are just here alone with our group, kind of surprising because our route is not harder than theirs. So tomorrow we will go for an acclimatization hike to C1 and come back to base, depending how everybody is feeling we will plan our next step. Our comfortable basecamp (Photos by Jon Otto). On the first day in base camp we reviewed some safety stuff. In the morning we went over all the different high altitude sicknesses and their treatment. Also we practiced how to use the Gamow bag; this is a portable high altitude pressure chamber to simulate a fast descent in case of high altitude sickness. We also have much different kinds of medicine which can help in case of high altitude sickness. After lunch we had some rope practice and reviewed all the necessary rope techniques and also the use of radios on the mountain. We use bamboo wands to mark the safe trail on the mountain; we practiced some different ways to mark hazards. Tomorrow we will go for a small acclimatization hike to the other base camp and see how busy it is over there, before we gain more altitude on the mountain the next day. Team going over how to operate the Gamow bag (Arnold Coster). After a beautiful sunny hike we arrived in base camp today. Everything went very smooth, after a 1 ½ hr drive from Tashkargan we arrived at the camel drop point. We loaded up the camels and had a small lunch, fresh local bread and water melons! The walk to Base camp is gentle and only takes about 4 hrs. Samdien our cook already pitched most of our tents when we arrived. After a delicious meal we watched the sunset and went to bed! Tomorrow we will do a little rope practice and some medical training. We will spend at least two full days here before we will go any higher. Team in basecamp (Arnold Coster). We arrived at Karakul Lake yesterday after a 4 ½ drive from Kashgar.Quickly we pitched our tent and at the point where we were almost settled the police showed up. Apparently we are not allowed to camp here anymore after doing this for 15 years????? We tried to bargain, but couldn’t convince the police. So there was nothing to do but pack our stuff again and search for a solution. We checked some of the accommodations at the Lake, but there was not enough room. That meant we had to drive up another 80km to the old town of Kashkargan at about 3100m. Everybody is happy we made that decicision; we had some excellent food in a small restaurant and a good sleep in a quiet Hotel. Yesterday two members were not feeling well, but today everybody was fine and we did a great hike! After breakfast we drove up to a little higher elevation, near some amazing hot springs and hiked around the hill all afternoon. We reached around 4000m and from the summit we had excellent views of Mustag ata in the distance and the green valley below. We hiked around for hours! Tomorrow after breakfast we will drive back and meet our Camels at 4000m, where we start our walk to Base Camp. Base Camp is at 4500 metres and it will take about 4-5 hrs to get there. Today our Cook, Samdien, together with some other staff already went ahead to prepare the camp. Tomorrow there will be a delicious lunch waiting for us when we finally arrive at our destination. Team in Kashkargan (Arnold Coster). Our expedition is packed and we are ready to go and also our last members arrived. Today our staff loaded up our truck with almost 2000kg of gear and tomorrow we will drive to Karakol lake. We had a great group dinner in Urdos restaurant; a nice place that serves delicious local food. Lots of kebabs, lachme (local handmade noodles with lamb and paulou, special steamed rice dish with dried fruits and meat). Tomorrow at around lunch time we will set off for the drive to the lake, only about 4-5 hrs from here. We are planning to spend two nights for acclimatization here at around 3600m. 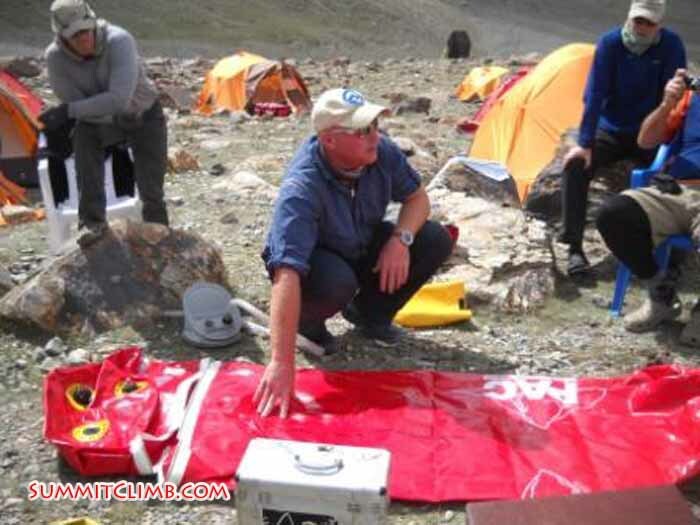 The members will also have some training in high altitude medicine, how to use the Gamow bags, etc. Of course there are some beautiful hikes to be done around the lake. Our staff will go up to Base Camp the next day to start preparing this, so when we arrive most thing will be ready. So my next dispatch will be from the mountain and the expedition really started. Kashgar’s old town is a very interesting place. Kashgar has been between different trade routes for centuries. Parts of the town still have the old town walls, some part date 2000 years back! There is also an old mosque built in 1402 AD. Between all this history there are hundreds of small shops, hidden in small alleys……Many craftsman are selling there goods for centuries handing over their knowledge from generation to generation. Also the Sunday marked is an interesting place to visit, trading goes on there the way it always been done. Only the goods have changed! Our Members will visit Shiptons Arc tomorrow, the biggest natural rock bridge in the world. 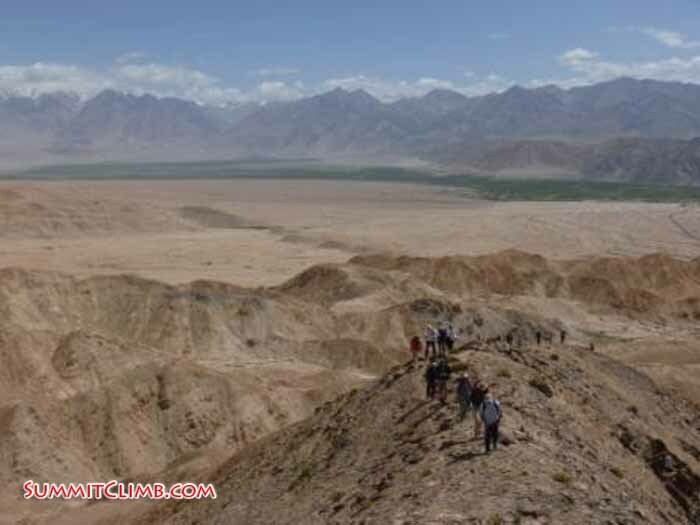 Discovered by the famous English explorer Eric Shipton in 1940 an still a lot of the mountains and desert outside Kashgar are still unexplored. An old mosque (Arnold Coster). Its nice and warm here in Kashgar. Its and amazing place; a strange mix between Persian and Chinese culture. In the town there are remains of a 2000 year old wall, the old mosk and on the other side new Chinese buildings! The food here is amazing. Everywhere on the street there are BBQ kebab place and the fresh noodles are very tasty too! The last couple of days we have been busy packing, buying supplies, checking gear. Today Eric our first member arrived. Tomorrow 6 more. 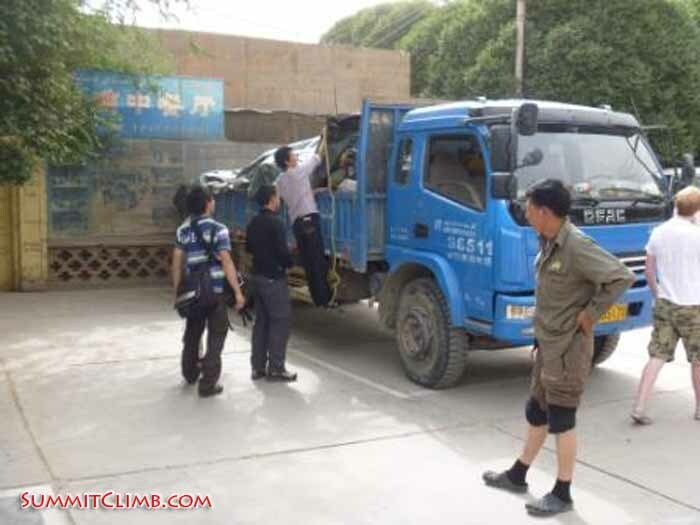 We are planning to leave Kashgar on Monday the 4th. So everything goes according to schedule, that's it for now. "Old Town" of Kashgar (Arnold Coster).